Made at SU class. 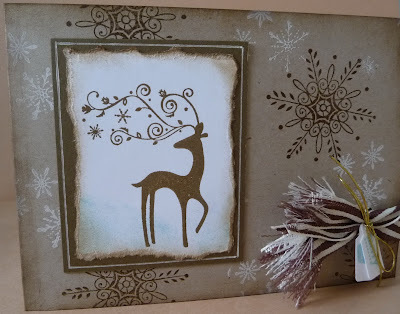 We used the same stamps as the previous card (Dasher and Serene Snowflakes). A new technique we learned was how to use SU shimmer paint. You really can't see it on the photo but the card has been sprayed a light shimmery gold. I have tried shimmer mists in the past and could not get on with them because I felt they warped the card too much. The SU shimmer paint has been mixed with alcohol so once sprayed the alcohol evaporates quickly and the card does not warp at all. lovely card, don't tell me you know own some SU shimmer paints, lol..